While ago I started my journey with Elixir. Learning the language was fun (I probably still have a few bits about OTP to catch up on, however). I pushed some simple commits to Elixir itself, made some bug fixes to Ecto. And then I figured I’m ready to learn how to use Phoenix, the web app framework similar to Rails. When I was working on a simple app, I generated some scaffold, then wrote some controllers of my own, started talking to database using Ecto models in controllers… and then it hit me. I know where this leads. This way of building apps seemed appropriate for basic CRUD type of things, but what if I need to include user permissions? What if I need to have different validations for my users, and different registration flows depending on what role they have been invited to on the platform? This would be the same mess as following the Rails way in that case. I started thinking about the ridiculously reliable and stable app we delivered for the British client a while ago. It is an intranet type of system for a corporation, with multiple levels of managers/employees, that can access different folders and files, upload payslips, review performance of supervised co-workers etc. What made it so good? We haven’t received a single bug report from the client during the two years it is live. I checked out the repository (no, I did not have need to keep it on my laptop otherwise - there are no bugs!) and looked around. There’s plenty of steps, and having 100% test coverage definitely helped to make the app super reliable, but I think the secret was somewhere else. Quite by accident, we have separated our application from Rails framework. Think about it, by having internal API, having it well defined and tested, we are using the framework merely as a means of passing the data to our application, sending it back and displaying in pretty form. This helped to make the updates go smooth between Rails releases, and I am sure it was a deciding factor to make the app so successful and reliable. Let’s have a look on how we separate internal API from the framework and surrounding libraries. As about any problem in computing, you’ll need extra layer of abstraction ;). In simplest apps, there is only one interface accessing our internal API. If this is the case, you might consider more traditional approach and integrate more tightly with HTTP layer of the framework to cut some development time and have less code. But there is a price you’ll have to pay if your application gets additional interfaces, and it usually does. Think about interface as a layer sitting between events such as user actions, cron jobs, bash scripts etc., and your application. The role of the interface layer is to feed internal API with data, get different data back and present back to user, script, database and so on. Let’s have a look at those diagrams from the perspective of user interacting with the application. 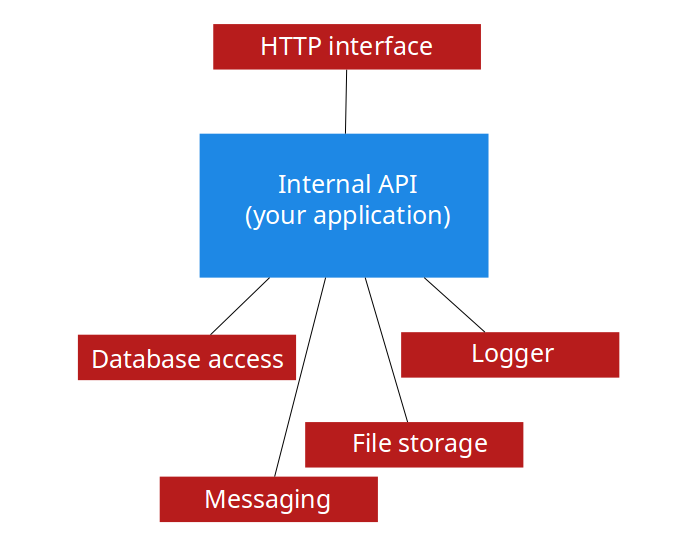 The requests come from the top, pass through one of the interfaces, reach internal API. This layer performs some operations and returns back data to the user. 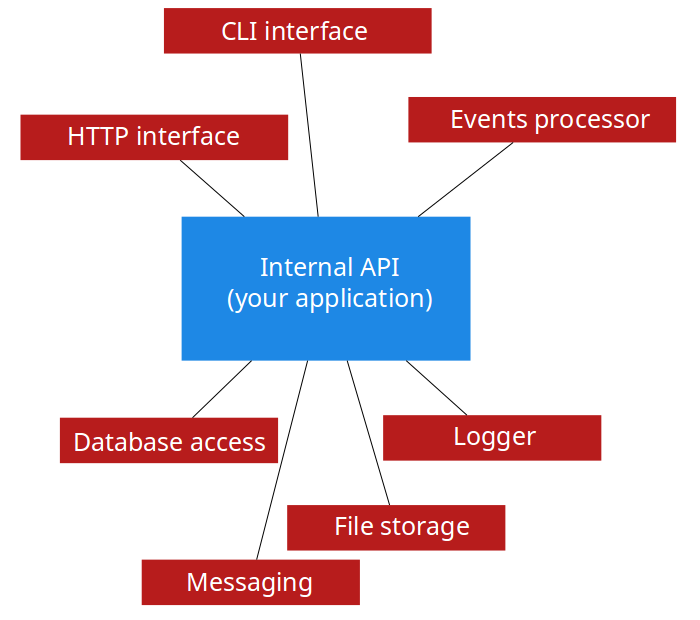 You can think of internal API as a black box sort of module, that is loosely coupled with the rest of the system you are building. Internal API layer can, and usually does, exploit other parts of your framework or libraries. It could talk to the database using ActiveRecord (or Sequel), send e-mails using SMTP (or Mandrill), save files in local filesystem (or S3). The “or” part in the previous sentence is important. By making these parts of framework private to your internal API, you can think of swapping them around with different ones as you need it, without a need to change single line of code in your Rails controllers. The important thing to note is that, in order to keep the system loosely coupled, the bottom layers (used privately by your internal API) do not leak to the top layers. This means your ActiveRecord models should not appear in the controllers directly, or be referenced by the Rake tasks. Instead, those layers should call appropriate methods in your internal API layer, that abstracts what is happening below. This way you will be able to replace your model with something that acts and quacks like one, but is not (think Virtus.model for example). No one said your internal API cannot be identical in some places to what the framework provides. I find the ActiveModel, and especially it’s validations, useful. I tend to move them away from my ORM to form objects, however. I found it useful if the internal API I am building, has a common entry point. I call it the app object, because that’s the name I am giving for the variable holding a reference to it. app object is a dispatch point to a tree-like structure of other objects, that together provide public interface to your internal API used by controllers or Rake tasks. The key thing here is that you can instantiate parts of the API to restrict access to certain data only. app.reports.list will have different filters depending on who is the user accessing the API (remember, we passed user_id to the app when we instantiated it!). This can be implemented by instantiating app.reports.list as a object of different class, for different types of users. It might even make sense to use some class-based inheritance here to provide common interface for all types of report lists. Use design patters such as template method to DRY-up your code. The other technique which I am found of, is to not only provide API that is aware of users’ restricted access to data, but that restricts user access to certain functions. For users who have read-only access to the list of reports, we simply instantiate app.reports using a factory that returns the app.reports object that does not even implement new_form interface for creating and saving forms. We can be even smarter, and in cases of attempting to access undefined / unavailable methods, raise custom exception. Let it crash as they say in Erlang community. The exception can be caught in the interface layer (or left to crash the system) to display error message to the naughty user. Unless you are writing Smalltalk, you need to store the code in files on the disk. 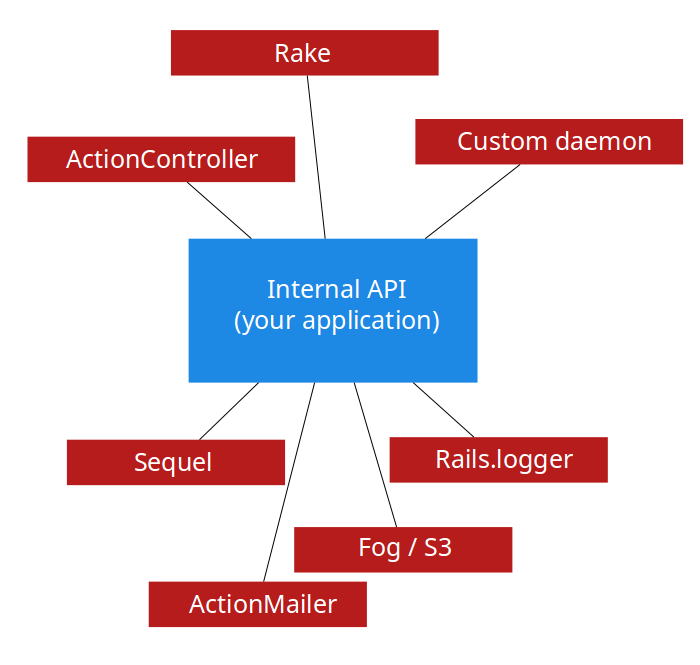 The Rails way is to have flat structure of classes and modules in app/models, or app/services. This is okay if you have little number of classes you use. I found, however, that people who try to extract their logic to service objects without using the app object pattern, could clutter their app/services (or similar) directory quite badly. Instead of having classes named ReporsListForAdministrators stored in app/services, I like to have it called ‘MyShinyApp::Reports::ListForAdministrators’ and saved in app/services/my_shiny_app/reports/list_for_administrators.rb. You can tweak those paths to make them shorter by playing with Rails autoload paths quite easily. The point is to save related classes grouped in directories, and namespace them in modules often corresponding to the tree-like structure of your internal API. How is that making building additional interfaces easier? We build different interface to access our internal API but the API itself hasn’t changed. We did not have to access database models directly, and changes the user makes using email interface would have the same results (and side-effects) as the ones performed from the HTTP interface. If you had custom logging, notifications/alerts built into your internal API, they would be called the executed when calling API from both interfaces equally. Having a clear layer of internal API, greatly improves your testing abilities. You can write functional black-box style tests for it easily. Those tests will run faster than Capybara/browser based ones, and you are able to test more edge case scenarios. Testing your interface can be limited to making sure the interface works okay and passes the data back and forth to your internal API as expected. If you build a big app, you might want to separate the APIs. For example, your administrator users would use different set of features than normal users. You can achieve that by instantiating different base app object in different parts of the application. Since our components are loosely based, I do not think there is anything wrong in re-using the same ORM models in the internal APIs if you need it, and you can make the behavior of them as similar or as different as you want. Think about your framework as something useful, something that can bring the value to your application, but do not integrate with it too tightly. This gives you the freedom to upgrade it, or even replace it in whole or parts in the future as you need it. You might even start to like it.